So, you’re a healthcare professional toying with the notion of investing a bit of time and resources into advertising on Facebook and/or Instagram, and you’re looking for a bit more information to fully persuade you into taking the plunge. You might be thinking to yourself: “man, that sentence is loaded with qualifiers.” And you might assume that you’re the only person on earth it could possibly pertain to. You’d be right on the first count, but dead wrong on the second. More and more pros in the healthcare space are flocking to Facebook’s ad network to promote their brands, attract clients, and help more people. WHY, ADHAWK? WHY IS THIS THE CASE? Well, for starters, the Pew Research Center estimated that in 2018, 68% of all adults in the United States are Facebook users. That’s a sizable chunk of your potential client base right there, scrolling through its collective news feed, advertisements and all. Then there’s the fact that healthcare-based decisions are rarely made impulsively. Maximizing touch points between would-be clients and your brand’s messaging is crucial. Even if a click on your ad doesn’t directly lead to a person picking up their phone and scheduling an appointment right away, you’re at least in the conversation. So you’re more likely to be remembered the next day when that person is searching for reviews for local chiropractors—many of whom are probably already advertising on Facebook! Are you sold on setting up some Facebook ad campaigns? You are? TERRIFIC. The setup of your Facebook Ad Account will vary a tad based on your end goal, and who you want to reach. Are you hoping to ingratiate yourself to new parents by sharing helpful articles on caring for infants? Do you want to encourage homeopathy aficionados to message your office ASAP, to get a discount on a consultory visit? If you’re an old hat at setting up ads on Facebook, skip past this section. If not, here’s a quick overview of how to set things up. Within Ads Manager, click on the green, rectangular “+ Create” button on the left of your screen. This prompts you to create a new campaign, ad set, and ad. Name your new campaign—ideally something pertaining to the objective of said campaign. Select “Auction” as your buying type. Then select a campaign objective. (More on those here.) Campaigns essentially set out the structure for your ads. Ad sets are where you are able to set your daily budget and establish audience targeting and ad placement. And this ad set will fall under the umbrella of the just-created campaign. Go ahead and name your ad set—it’s probably wise to name it for the audience type you are planning on targeting with it. We’ll jump back into targeting in the next section! Feel free to name your first ad for this campaign and ad set. For organizational purposes, give it a name that tells you which campaign and ad set it belongs to, as well as what sort of visual asset it contains. If you’re struggling to articulate just who you want your ads to reach, or the action you hope they drive, it’s probably helpful to think about who your current, actual patients and customers are. You probably already have a sense of who your clients or patients are, demographically. Do they skew older? Mostly men? Do they drive from a county or two away to see you, or are your patients largely local? It’s also smart to talk to them. What about your specific set of offerings drew them to you in the first place? This is where you can create audiences based on people who have previously interacted with your Facebook or Instagram page or visited your website. These are terrific options for remarketing campaigns. You can create a new custom audience within this window, or reuse an existing one. NOTE: to target ads toward site visitors, you’ll need to ensure you have a Facebook Pixel installed on your page. Here are some handy instructions on how to set up your Facebook Pixel. A particularly powerful subset of custom audiences that Facebook generates by compiling a dynamic list of people whose online actions indicate they might be similar to a group of established, well-qualified people. For instance, you can create a Lookalike audience of millions of people who demographically and behaviorally resemble people who have visited your site in the past 30 days. It’s a higher quality cold audience than you might generate through other means. Facebook lets you target folks based on their location, age, gender, and spoken language. Locations can be targeted radiating outward from a given area, or within the confines of a geographic boundary like a city or state. Unless you know you only serve people of specific ages and genders, it’s best to leave those open for now—you can narrow down later once you’ve accumulated performance data for your ads. The languages you target should be the languages your ads are typed in. You’re able to serve ads to people who have demonstrated given interests on the platform, or who Facebook believes falls into certain demographics. Political leanings, parental status, level of educational attainment, major life events, and job title are a few examples of demographic data Facebook keeps tabs on and lets you incorporate into targeting. Food preferences, musical passions, and general hobbies are examples of interests. Behaviors you can target include: propensity to travel, a tendency to shop online, and those with upcoming anniversaries. For more, here’s an in-depth look at strategies pertaining to targeting and Facebook Ad Tools, among other things. One super important thing to be cognizant of is Facebook’s estimate of your “audience definition.” As you tinker with your targeting, this audience size will change. Too large, and you risk serving your ads to disinterested parties. Too small and you’ll wind up serving your ads to the same people too often. You can find out a bit more about the nuts and bolts behind lookalikes here, but all you really need to know is that they are not static, so their membership changes. This can help keep frequency low, and ensure your ads are being served to fresh audiences without you having to continually re-upload base audiences into Facebook. Facebook and Instagram are inherently visual mediums. Even if you’re starting out with just stock images, there are certain parameters you can aim to follow with your imagery and general ad design. Build trust. Regardless of your advertising goals, one of your key objectives ought to be to solidify yourself as a reputable, trustworthy, and compassionate source of healthcare wisdom. It’s probably best to avoid memes, outlandish claims, puns, or anything that might come across too tongue-in-cheek for your target audience: people who want to improve their health in some way. Be honest. This goes hand-in-hand with building trust, but it’s perhaps the most important aspect of developing potential client trust so we’re doubling down on it. Don’t fudge statistics. Don’t use scare tactics. Paint a realistic picture of the services or products you offer. Accentuate the pain point. Yes, this bullet point could be construed as wordplay. And also yes, that goes in direct opposition to our first bullet point. But this isn’t a Facebook ad, so cut us some slack. Your ad should clearly state what health issues your services seek to address. You’re an Active Release Therapist? Explain succinctly how you help people treat chronically sore muscles. Be positive. This should go without saying, but it’s best to avoid threats and put-downs in advertising—especially so in healthcare advertising. Please, do not make fun of prospective clients for their theoretical conditions. And don’t suggest imminent death or poor health if they ignore your ad. In some ways, digital advertising is still like the Wild West. You’ve probably been served an ad on a seemingly innocent enough website before that made you blush and quickly close your screen. As such, platforms like Facebook do impose certain restrictions in an attempt to clean up the perception of being complicit in a lawless online experience. We trust you to be on your best behavior as a Facebook advertiser. So here are a few things to avoid promoting—lest you fall out of Zuckerberg and the gang’s good graces! More on that here, as well as the overall ad review process. Oh. And you can’t include those misleading before-and-after images for weight loss, diet, or health-related products or services. 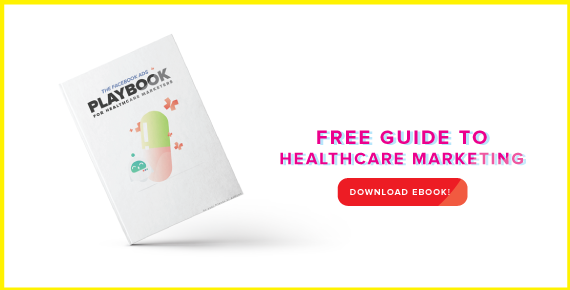 Well, you’ve made it this far, so here’s your reward—as well as what you probably were looking for all along great Facebook healthcare ads, plus some rationale behind what makes them so good. The above ad clearly addresses a concern some new parents might have about vaccinating their infants and establishes trust by linking to an authoritative bit of content. It also includes a cute photo of a baby (generally a savvy move). One Medical’s ad cuts right to the chase. They offer same- and next-day appointments, all-day medical support, and 20 locations within its targeted geographic area. It’s not overtly salesy. But this ad presents a strong pitch for potential first-time patients. Look! Look at all the lovely family time you could reintroduce into your life if you didn’t have to worry about all the annoyances associated with conventional health insurance! Your kids would like reading and go to bed at a reasonable hour! Not to mention a purported lack of agents. This ad isn’t promoting a conventional healthcare service, but it still does a nice job of clearly asking viewers if they are looking for precisely what they offer. The copy is clear and crisp. Bonus points would have been awarded had there been a carousel of images depicting travel nurses hard at work (as in the above ad), as well as enjoying life in a wide range of locations. You’ve made it through our guide! You know the ins and outs of healthcare advertising on the oft derided but rarely deactivated platform, Facebook! Target your audiences wisely and purposefully. Treat said audiences with respect. And make sure those ads are eye-catching and clear.